Francisco Jose Rodríguez… Married to Luinitza Erianne de Rodríguez (2/2/16)… Has seven children: Adriana Rashell (3/5/01), Destiny Franchesca (5/17/02), Francisco José & Anguielina Isabella (9/14/09), D'Angelo José (11/25/11), Fabiana Nelitza (5/5/13) and Dylan Abraham (11/5/14)… Has 13 siblings and was raised by his grandparents… Pitched for the 1998 Venezuelan National Team at the Pan-American Youth Championship in Mexico… Attended Juan Lovera School in Venezuela, where he played baseball, basketball and volleyball…Hobbies: Going to the beach, fishing and spending time with the family…Signed by:George Lazarique and Bob Fontaine Jr.
Began the season with DET and made 28 appearances before being released on 6/23...Signed by WSH on 7/3 and pitched in 5 minor league games before being released on 7/14. Completed his first season with the Tigers in 2016, appearing in 61 games and posting a 3-4 record with 44 saves, a 3.24 ERA (58.1IP/21ER) and 52 strikeouts...Finished the season with 44 saves, which ranked as the second most in a season in Tigers history, trailing only Jose Valverde, who saved 49 games in 2011... Ranked second in the AL with 44 saves, while he was seventh with an 89.8 save percentage... Posted 40-or-more saves in a season for the sixth time in his career, which is the third most 40-save seasons in MLB history, trailing only Mariano Rivera and Trevor Hoffman, who each had nine 40-save seasons... Finished the season with 430 saves in his major league career, which ranks fourth in MLB history -- passed John Franco (424), Billy Wagner (422) and Dennis Eckersley (390) on the MLB all-time saves list in 2016...Placed on the family medical emergency list on April 24 and was reinstated on April 27... Notched the 400th save of his major league career on May 24 vs. Philadelphia, becoming the sixth pitcher in major league history to reach 400 career saves, joining Mariano Rivera (652), Trevor Hoffman (601), Lee Smith (478), John Franco (424) and Billy Wagner (422)...Recorded his first four-out save of the season on June 1 at Los Angeles (AL)…also had four-out saves on July 25 at Boston, August 26 vs. Los Angeles (AL) and September 18 at Cleveland... Successfully converted 19 consecutive save opportunities from April 6-June 12...had a 2.08 ERA (21.2IP/5ER) and 23 strikeouts during the stretch... Recorded his 24th save of the season on July 9 at Toronto, throwing a perfect ninth inning with one strikeout -- his 24 saves before the All-Star break were tied for the most in franchise history, equaling the number set by Todd Jones in 2000 and Jose Valverde in 2011...Pitched in nine games during July and had a 1-1 record with seven saves, a 1.00 ERA (9.0IP/1ER) and eight strikeouts... Made the 900th appearance of his major league career on August 3 vs. Chicago (AL), throwing a scoreless inning with one hit allowed, two walks and one strikeout to notch his 30th save of the season - became the 25th pitcher in MLB history to appear in 900-or-more games...Did not allow a run in 13 of 14 appearances from August 13-September 22 - had a 2-0 record with 12 saves, a 0.60 ERA (15.0IP/1ER) and 10 strikeouts during the stretch...Converted a perfect 11-of-11 save opportunities and did not allow a run over 10.2 innings pitched in 11 games against American League East opponents this season... Lefthanded hitters posted a .204 (22x108) batting average, while righthanders batted .225 (23x102) against him... Went 2-3 with 21 saves, a 3.45 ERA (28.2IP/11ER) and 24 strikeouts in 31 games at Comerica Park, while he was 1-1 with 23 saves, a 3.03 ERA (29.2IP/10ER) and 28 strikeouts in 30 appearances on the road... Converted 24 saves and posted a 2.93 ERA (30.2IP/10ER) with 30 strikeouts in 33 games prior to the All-Star break, while he went 3-4 with 20 saves, a 3.58 ERA (27.2IP/11ER) and 22 strikeouts in 28 games following the All-Start break. Named to the National League All-Star Team for the second straight year as he pitched in 60 games for the Brewers in 2015. • Finished the season with a 1-3 record, 38 saves, a 2.21 ERA (57.0IP/14ER) and 62 strikeouts. • Converted 38-of-40 saves to rank second in the National League with a 95.0 save percentage...also ranked tied for fifth in the NL with 38 saves. • Recorded the 350th save of his career on April 23 vs. Cincinnati. • Made 11 appearances during the month of May and had five saves with a 0.82 ERA (11.0IP/1ER) and 14 strikeouts. • Named the Brewers Pitcher of the Month in June after saving nine games and compiling a 1.50 ERA (12.0IP/2ER) and 16 strikeouts. • Successfully converted his first 30 saves of the season from April 13-August 29...his first blown save of the season came on August 29 vs. Cincinnati. • Posted a 1-0 record with seven saves, a 0.93 ERA (9.2IP/1ER) and seven strikeouts in 11 appearances during September. • Went 0-2 with 19 saves, a 1.41 ERA (32.0IP/5ER) and 37 strikeouts in 32 outings before the All-Star break...had a 1-1 record with 19 saves, a 3.24 ERA (25.0IP/9ER) and 25 strikeouts in 28 appearances after the All-Star break. • Held righthanded hitters to a .172 (17-for-99) batting average...lefthanders hit .206 (21-for-102) against him. Notched 40-or-more saves for the fifth time in his career and first time since 2008 as he saved 44 games for the Brewers in 2014. • Selected to the National League All-Star Team for the second time in his career and it was his fifth selection overall. • Went 5-5 with 44 saves, a 3.04 ERA (68.0IP/23ER) and 73 strikeouts in 69 appearances. • Led the National League with 66 games finished, while he ranked tied for third with 44 saves. • Converted 44-of-49 (89.8 percent) of his save opportunities. • Began the season by not allowing a run in his first 19 appearances of the season (19.0IP) and converted each of his first 15 save opportunities. • Led the majors with 13 saves in March/April and finished the month with 23 strikeouts in 16.0 innings. • Recorded his 1,000th career strikeout on August 27 at San Diego, striking out Abraham Almonte. • Made 29 appearances on the road and had 23 saves with a 1.93 ERA (28.0IP/6ER) and 33 strikeouts...went 5-5 with 21 saves, a 3.83 ERA (40.0IP/17ER) and 40 strikeouts in 40 home outings. • Limited lefthanders to a .176 (22-for-125) batting average...righthanded hitters hit .221 (27-for-122) against him. Was re-signed by Milwaukee to a minor-league contract on 4/17 and made 4 relief appearances between Class-A Brevard County (2g) and Triple-A Nashville (2g) before his contract was selected by the Brewers on 5/16...Went 3-2 with a 2.70 ERA and 10 saves in 48 relief appearances with Milwaukee and Baltimore...Was a perfect 10-for-10 in save opportunities, all with the Brewers...Went 1-1 with a 1.09 ERA and 10 saves in 25 appearances with Milwaukee as he held opponents to a .198 batting average with 26 strikeouts in just 24.2 innings...Went unscored upon in 22 of his 25 appearances with the Brewers...Earned his 300th career save on 6/22 vs. Atlanta.....became the 25th pitcher in Major League history to reach that milestone...Was traded to Baltimore on 7/23 in exchange for 3B Nicky Delmonico...Went 2-1 with a 4.50 ERA in 23 appearances with the Orioles...Pitched for Team Venezuela in the World Baseball Classic (2g, 2.1ip, 2h, 1r, 1er, 0bb, 2k, 1hr)...Re-signed with Milwaukee as a free agent on 2/7/14. Went 2-7 with a 4.38 ERA and 3 saves in a career-high 78 relief appearances with Milwaukee...Struck out 72 batters in 72.0 innings, snapping a streak of nine straight seasons with more strikeouts than innings pitched.....tied Robb Nen (1994-2002) and Pedro Martinez (1996-2004) for the second-longest streak in Major League history (min. 50ip)...Went unscored upon in 21 of his last 24 appearances, posting a 1.93 ERA (23.1ip, 5er)...Elected free agency on 10/29. Went 6-2 with a 2.64 ERA and 23 saves in 73 relief appearances between New York-NL and Milwaukee...Held opponents to a .243 batting average, including .209 with the Brewers...Struck out 79 batters in just 71.2 innings...Went 23-for-29 in save opportunities (79.3%), including 0-for-3 with the Brewers...Was not brought into any traditional save situations with the Brewers.....Milwaukee was 3-0 in the games in which he was charged with a blown save with Rodriguez getting the win twice...Posted his seventh career and consecutive 20+ save season...Began the season with the Mets and went 2-2 with a 3.16 ERA and 23 saves in 42 games...Was acquired by Milwaukee, along with cash, in exchange for two players to be named on 7/12, the night of the All-Star Game.....the two players named were LHP Daniel Herrera and RHP Adrian Rosario on 9/1...Went 4-0 with a 1.86 ERA in 31 games with Milwaukee.....was unscored upon in 27 games...Was originally issued #75 but switched to #57, the number he wore with the Angels.....did not appear in any games as #75 with the Brewers...His vesting option for 2012 (based on games finished) was changed to a mutual option on 7/15...Earned the victory in his Brewers debut, an 8-7 win on 7/16 at Colorado (1ip, 1k)...Tied for the National League lead with 17 holds from 7/16 through the end of the season...Did not allow an earned run in any of his last 16 appearances (14.2ip)...Notched his first Major League hit with an infield single off Jose Veras on 8/12 vs. Pittsburgh.....was the second at-bat of his career (both in 2011).....left the game with a right leg strain suffered while running to first base...Was the winning pitcher in the Brewers' National League Central-clinching 4-1 victory on 9/23 vs. Florida as he stranded a pair of inherited runners in the eighth inning (0.2ip, 2k)...Went 0-0 with a 1.80 ERA in 5 postseason games...Was offered arbitration on 11/23.....accepted on 12/7...Signed a 1-year contract on 1/17/12, avoiding arbitration. Went 4-2 with a 2.20 ERA and 25 saves in 53 relief appearances with New York-NL...Held opponents to a .213 batting average with 67 strikeouts in just 57.1 innings...His 25 saves ranked 10th in the National League...Went 25-for-30 in save opportunities (83.3%)...Produced his sixth career and consecutive 25+ save season...Earned his 250th career save on 5/22 vs. New York-AL, becoming the 29th pitcher in Major League history to reach that total...Was placed on the restricted list from 8/12-8/13 as a result of an altercation at Citi Field following a game on 8/11...Was placed on the disqualified list from 8/17 through the remainder of the season after it was discovered he had torn the ligament in his right thumb in the 8/11 incident. Finished tied for seventh in the National League with 35 saves...It was his fifthstraight year with 30 or more saves...Over the last five years (2005-2009), he leads the majors with 229 saves...Minnesota's Joe Nathan is second with 202...Notched his 238th career save in New York's 4-2 win vs. Chicago (NL) onSeptember 6th to become the all-time saves leader by a Venezuelan-bornpitcher, passing Ugueth Urbina...Now has 243 career saves...His 35 saves were the sixth-most in franchise history in a single season...It wasalso the second-highest total by a pitcher in his first season with the Mets,behind Billy Wagner's 40 saves in 2006...Named to his fourth All-Star team...Pitched a 1-2-3 ninth inning in the All-StarGame at St. Louis...Converted his first 16 save opportunities with the Mets to establish a franchiserecord...His streak ended with a blown save on June 12th against the Yankeesat Yankee Stadium...Anthony Young held the previous mark with 12 straightsaves in 1992...Had a 0.57 ERA (two earnedruns/31.1 innings pitched) in his first30 appearances...That's the lowestERA by any reliever in team historyover his first 30 outings of a season...The previous mark was 0.58 ERA byDoug Sisk in 1984...Held opponents to a .169 (20-118)batting average with runners onbase, the eighth-lowest average inthe majors (minimum 100 at-bats)...Opponents hit .119 (5-42) againsthim with two-or-more runners onbase...Has struck out 11.4 batters per nineinnings during his major leaguecareer, the third-best ratio all-timeamong pitchers with at least 400games...Also has held the oppositionto a .191 batting average, the thirdlowestmark in major league history(minimum of 400 games)...Did not allow an earned run in 55 of his 70 outings...Notched 73 strikeouts in68.0 innings...Lefthanded batters hit .185 (24-130) and righthanded hitters had a .223(27-121) batting mark...Went 2-1 with 20 saves and a 2.33 ERA (10 earned runs/38.2 innings pitched)at Citi Field...Stranded the bases loaded in consecutive outings: September 2nd at Coloradoand September 4th vs. Chicago (NL)...Picked up his third win by striking out the side on August 16th vs. San Francisco in New York's 3-2 victory...Pitched 2.0 innings on July 2nd at Pittsburgh to notch his second victory in a 9-8 win in 10 innings...Saved three, 1-0 games (April 18th vs. Milwaukee, May 6th vs. Philadelphia and July 1st at Milwaukee)...Two of thosesaves (May 6th vs. Phillies and April 18th vs. Brewers) preserved a victory for Johan Santana...Twenty other pairs ofteammates notched a win and a save in a pair of 1-0 games in one year, but Rodriguez and Santana were the first to doit before the end of May...With his save on May 7th vs. Philadelphia, he recorded saves in four consecutive days (May 4th-May 7th), a personalbest...The last Mets pitcher to save a game on four consecutive dates was Braden Looper on May 31-June 3, 2004...Did not allow an earned run in 16.0 innings in May...Only four other Mets pitchers have thrown that many innings ina month without allowing an earned run (Dwight Gooden in September, 1985-44.0 innings pitched, Rick Aguilera inMay, 1989-19.1 innings pitched, Cal Koonce in May, 1968-17.2 innings pitched and Duaner Sanchez in April, 2006-16.0innings pitched)...Was named the Mets SharpPitcher of the Month for May...Did not surrender an earned run over 25.2 inningsfrom April 27th-June 16th...Tossed 2.0 shutout innings to pick up his first win asa Met on May 12th vs. Atlanta in a 4-3, 10-inningtriumph...Earned three saves and didn't allow a run in 5.2innings in five games for Venezuela in the WorldBaseball Classic...Notched eight strikeouts...Was 1-1 with one save in six games for Tiburones deLa Guaria of the Venezuelan Winter League...Recorded seven strikeouts in 5.0 innings of work. Set major league records with 62 saves and 69 chances (Bobby Thigpen, 57 and 65 in 1990)...Tewenty-three saves camewith a one-run lead, while 22 were with a two-run advantage...Earned his 58th save to set a single-season record on September 13th vs. Seattle...His 62nd save came on September 24that Seattle in his 69th chance...Was the quickest to 50 saves (129 games), 40 saves (98 games), and 30 saves (76 games) in MLB history...His 30th saveon June 22nd was also earliest by date...Atlanta's John Smoltz held the 40-save mark at 108 games in 2003, while DannyGraves reached 30 saves on June 30, 2004 in Cincinnati's 77th game...Became the youngest pitcher to save 50 games in a season when he did so at 26 years, 7 months and 17 days (Eric Gagne,26 years, 8 months and 14 days on September 21, 2002)...Collected the 200th save of his career on September 2nd at Detroit...Became youngest pitcher in history with 200 saves (26years, 239 days)...Was also the youngest to 100 saves, reachingthe mark on September 10, 2006 at the age of 24 years and224 days...Broke John Smoltz's record of most saves by the All-Star break(34 in 2003), recording number 38 on July 13th at Oakland...Converted 25 straight saves (April 14th-June 11th), breaking hisown team record off 22 (August 20, 2005-April 16, 2006)...Won the American League Player of theWeek award for the weekof July31st- August 3rd...Had three saves, five strikeouts and didnot allow a run in 4.0 innings...Made his third AL All-Star squad...Threw 0.1 innings during the American League's 4-3, 15 inning win at Yankee Stadium. Completed season with 5-2 record, 40 saves (45 chances) and a 2.81 ERA (67.1 IP - 21 ER) in 64games...Led club in games finished (56) and saves...Ranked tied for second in AL with 40 saves, markingthird consecutive 40 save campaign...Posted 38th save of season Sept. 23 vs. Seattle (1 IP, 1 SO) toclinch AL West Division title...His 132 saves since start of 2005 season are most in Majors (T. Hoffman- 131)...Posted nine saves in April and nine in May...ERA in May was 1.46 (12.1 IP - 2 ER) in 12 games...Collected three wins and two saves in seven games in July...Was 2-0 with 22 saves and a 2.20 ERA (32.2IP - 8 ER) in 30 games on road...ERA was 2.33 before All-Star break and 3.45 after...Longest outing wastwo innings pitched (four times)...Struck out three batters in an outing eight times...His 12.0 SO per 9 IP(min 250 IP) career ratio ranks third best in MLB history behind Brad Lidge (12.7) and Rob Dibble (12.1)...Named to second All-Star team (also 2004) and earned the save in AL's win one-run win. Rodriguez set Angels single-season record with 47 saves in 2006 and also led the Major Leagues in that category. He became the youngest pitcher to reach 100 career saves at 24 years old when he closed the door on the Blue Jays on Sept. 10. Rodriguez was named The Sporting News American League Fireman of the Year. He also won the DHL Delivery Man of the Month for August, in which he saved 12 games, tying the team record for saves in any month (set by Rodriguez in September 2005 and Bryan Harvey in September 1991). Rodriguez didn't allow a run from June 26 to Sept 15, a span of 30 2/3 innings. He had 17 straight saves from Aug. 1 to Sept. 14, He set a team record with his 21st straight save on April 8 against the Yankees, a mark that dates back to 2005. Rodriguez ran the record to 22 in a row before blowing a save against the Twins on April 19. He had a 0.55 ERA in his final 48 outings. He only blew four saves in 2006 and has converted 65 of his last 69 opportunities. Rodriguez held batters to a .197 average and was two strikeouts shy of becoming the first Angels reliever to have two seasons with 100 or more strikeouts. His 1.73 ERA was a career low, as were his 28 walks. Rodriguez finished with a 2-3 record. He struck out the side on eight occasions, including on Sept. 30, when he picked up his 47th save. Rodriguez pitched for Venezuela in the World Baseball Classic and earned one save while tossing three scoreless innings. Completed first full season as Angels closer with 2-5 record, 45 saves (50 chances) and 2.67 ERA (67.1 IP - 20 ER) in 66 games...Saves total ranked tied for first in AL (Bob Wickman, Cle. ), marking second time an Angel has led league in category (Bryan Harvey - 46, 1991)...Posted 43rd save, Sept. 27 at Oakland (1 IP, 1 H, 1 R, 1 ER, 1 HR, 1 SO), recording final three outs of AL West clincher...45 saves is second most saves in Angels' single season (Harvey)...Joins Washington's Chad Cordero (2005) as second pitcher in ML history to record a 40-save season before turning 24 years old...Converted final 18 save chances...Allowed 3 ER last 17 outings (16.2 IP, 1.62 ERA)...Converted 13 consecutive saves, June 25-July 23...Posted 12 saves in Sept., tying club record for saves in a month (Harvey, 12 in Sept. 1991)...Also posted 11 saves in July...21 of his 45 saves came in one-run games...Disabled May 23 (retro to 5/15) - June 1 due to mild strain of right forearm (first DL stint of career)...Worked in 10 of last 15 games of season...172 career average against is best among all actives (min. 500 BF). Finished 4-1 with 12 saves and a 1.82 ERA (84 IP - 17 IP) in 69 gamespitched...Finished tied for fourth in AL Cy Young Award ballotingwith one third place vote...Set career highs in ERA, innings pitched,strikeouts, saves and games...Led club in ERA and games pitched...69games pitched ranks tied for third on Angels' single-season list...Selected by the fans as 2004 Major League "Set Up Man of the Year"as conducted by MLB.com...Becomes second consecutive Angel towin award, joining Brendan Donnelly (2003)...On Angels' All-time list,ranks first in strikeouts/9 IP (11.83), fewest hits/9 IP (5.33) and fewestbaserunners/9 IP (8.91) and fourth in ERA (2.36)...Allowed 6 of 30inherited runners to score...Retired 48 of 69 first batters faced...Along with Scot Shields, became first pair of relievers to reach100 strikeouts in same season in club history and first duo to accomplish feat in major leagues since Armando Benitez (106)and Arthur Rhodes (102) for Baltimore in 1997...123 K's are most in a season in club history by a reliever (previously DeWayneBuice in 1987 - 109 K's...Notched 100th strikeout of season, Aug. 24 vs. Kansas City, the fifth Angels' reliever to accomplishfeat...Reached mark in 65.1 IP, fastest among the five (previously 74 IP by Troy Percival in 1996)...Posted 13.2 SO/9 IP ratio, topsin major leagues, and 11.83 SO/9 IP in career, best in club history...Collected at least one strikeout in 58 of 69 outings...Struck out123 of 335 (37%) batters faced...60 of his 69 outings were scoreless...Struck out the side in ninth inning on 10 pitches, July 17vs. Boston...Named to first All-Star team and pitched two-thirds of an inning at Minute Maid Park in Houston (.2 IP)...At 22 yearsold, was youngest player on AL squad...Suffered only loss of season, June 4 vs. Cleveland (1 IP, 3 H, 3 R, 3 ER, 1 HR, 1 BB, 2 SO,1 HB)...Marked lone career loss in Anaheim...Allowed more earned runs (3) in outing than over his first 25 outings (2)...2004Post-Season...Appeared in two games in ALDS vs. Boston, compiling 0-2 record and 3.86 ERA (4.2 IP, 4 H, 2 R, 2 ER, 3 BB, 5SO)...Was member of MLB All-Star squad that participated in Japan Series...Posted no record and 6.00 ERA (3 IP, 4 H, 2 R, 2 ER,1 HR, 1 BB, 4 SO, 1 HR) in four games pitched...Pitched for La Guaira of Venezuelan Winter League this off-season, posting a 0-0record, four saves and 0.00 ERA (15 IP) in 13 games (one start)...Allowed four hits, walked six and struck out 30 batters. Spent fifth professional season with Angels, marking first full season in major leagues...Compiled 8-3 record with twosaves and a 3.03 ERA (86 IP - 29 ER) in 59 games...Allowed 50 hits (12 HR), walked 35 and struck out 95 on season...Hasallowed 5.2 hits and struck out 10.6 batters per nine innings in brief career...Wins total ranked third on club...59 gamespitched is fifth-highest total by an Angel in first season in club history...Also finished in the Angels' Rookie Top 5 inrelief appearances (T4th, 59) and strikeouts per 9 innings pitched (2nd, 9.9)...12 HR allowed is most by an Angel rookiereliever in club history...Allowed two grand slams on season (David Segui, July 20 at Baltimore & Randy Winn, Sept. 13at Seattle)...Allowed 13 of 30 inherited runners to score and retired 39 of 59 first batters faced...Posted first career saveApril 11 vs. Oakland...Other save came Sept. 26 vs. Texas...Opponents batted .172 against him, tops in AL...Allowed 15earned runs in final 42 appearances (60.1 IP - 2.24 ERA)...Had allowed seven runs in first seven outings (11.1 IP)...ERAlow was 2.65 on Sept. 8...Earned first major league win in regular season, April 17 at Texas (1.2 IP, 1 H, 1 BB, 3 SO)...Wonfive straight decisions, April 16-July 9 (29 games), one shy of club record...Longest outing was three innings pitched, Aug.9 at Cleveland (1st game)...Pitched two or more innings in a game 21 times...Allowed a run in 19 of 59 games pitched...Strikeout high was four, June 30 vs. Texas and Aug. 3 vs. Toronto...ERA was 0.00 against eight opponents, including allfour interleague teams (9.1 IP, 1 H, 7 SO)...Posted 1.15 ERA (15.2 IP - 2 ER) in 10 June appearances...Was 1-0 with a 1.72ERA in 11 Aug. games...Finished 4-0 with two saves and a 2.36 ERA in 30 home games, compared to 4-3 mark and 3.79ERA in 29 road contests...Was 5-1 with one save and a 3.00 ERA in 33 games prior to the All-Star break and 3-2 with onesave and a 3.08 ERA in 26 contests after...Rookie of the Year for the Venezuelan Winter League in 2004...Alberto Callaspofinished second. In 2002, made major league debut, Sept. 18 at Oakland, at the age of 20 years, eight months and 11 days...Tied Angels'club record by striking out eight consecutive batters over four games, Sept. 18-25...Nolan Ryan also accomplished the feattwice (each time in one game)...At 20 years, 286 days, became youngest pitcher ever to win a World Series game workingthree innings (4 SO) of scoreless relief in Game 2 (26 pitches, 22 strikes)...Win was fifth of post-season, tying RandyJohnson (Ari., 2001) for the most ever in a single post-season, and setting the standard for post-season wins by a reliever...The cap worn by Rodriguez during Game 2 was sent to the Baseball Hall of Fame in Cooperstown, NY...His 28 strikeoutswere the most ever by a relief pitcher in one post-season in major league history...The old mark of 18 was shared by JesseBarnes (1921 Giants) and John Rocker (1999 Braves). September call-up with Angels made splash on big league level in final three weeks to earn spot on post-seasonroster...Made major league debut, Sept. 18 at Oakland, at the age of 20 years, eight months and 11 days...Tied Angels'club record by striking out eight consecutive batters over four games, Sept. 18-25...Nolan Ryan also accomplished thefeat twice (each time in one game)...Worked 2.1 innings Sept. 27 vs. Seattle's striking out five batters, to tie BrendanDonnelly for most strikeouts in a game by an Angels' reliever in '02...Struck out 13 of his 23 total batters faced withAnaheim...Struck out side in second major league appearance, Sept. 19 at Oakland (1 IP)...Had contract selected from SaltLake, Sept. 15...Split 2002 campaign between double-A Arkansas and Salt Lake...At Arkansas, was 3-3 with nine savesand a 1.96 ERA (41.1 IP - 9 ER) in 23 relief outings...At Salt Lake, posted 2-3 mark with six saves and 2.57 ERA (42 IP - 12ER) in 27 games...For 2002, combined minor league record was 5-6 with 15 saves, 120 strikeouts and a 2.27 ERA (83.1 IP- 21 ER) in 50 games...Was ranked as Angels' seventh-best prospect by Baseball America in 2002 and selected to play inMLB Futures Game in Milwaukee during the All-Star Break...Still qualified as a rookie in 2003...Ranked as Anaheim's topprospect by Baseball America for 2003. At 20 years, 286 days, became youngest pitcher ever to win a World Series game working threeinnings (4 SO) of scoreless relief in Game 2 (26 pitches, 22 strikes)...Win was fifth of post-season, tying Randy Johnson(Ari., 2001) for the most ever in a single post-season, and setting the standard for post-season wins by a reliever...The capworn by Rodriguez during Game 2 was sent to Cooperstown...His 28 strikeouts were the most ever by a relief pitcher inone post-season in major league history...The old mark of 18 was shared by Jesse Barnes (1921 Giants) and John Rocker(1999 Braves)...Set up Troy Percival's World Series Game 7 save tossing a scoreless eighth inning with three K's...Limitedopponents to .156 average against during course of post-season and averaged 13.5 K's per 9 IP...Suffered first loss ofpost-season and ML career in Game 4 of WS (2 IP, 2 H, 1 R, 0 ER, 2 SO)...Unearned run was due to a Bengie Molinapassed ball...Collected fourth victory of post-season in Game 5 of ALCS, becoming fifth A.L. pitcher to win four gamesin a post-season, matching the most in A.L. history...Became second rookie ever to win four games in the post-season(Livan Hernandez, 1997 Marlins)...Posted first win of 2002 ALCS in Game 3 vs. Minnesota and third of post-season (3-0)...Appeared in three games of Division Series vs. New York, posting wins in Game 2 (2 IP, 2 H, 2 R, 2 ER, 1 HR, 1 SO - firstML win) and Game 3 (2 IP, 4 SO)...Became second pitcher in major league history to win two playoff games before the ageof 21 (Fernando Valenzuela in 1981), the first Angel to win two post-season games and the first major league pitcher topost the first two major league wins of career in the post-season...Along with John Lackey (2) and Brendan Donnelly (1),the three rookies accounted for eight of Anaheim's 11 post-season wins...He and Donnelly led Anaheim pitchers with 11post-season outings. Spent season at single-A Rancho Cucamonga...Began campaign on disabled list with elbow tendinitis and didnot appear until late May...In 20 starts, posted five double-digit strikeout games and four games with eight strikeouts ormore...Struck out 147 batters in 113.2 IP at a pace of 11.6 per 9 IP, good for second in the California League...Struck outcareer-best 12 batters on three occasions...Tossed first complete game shutout of his career, June 10 vs. Mudville (9 IP, 2H, 1 BB, 12 SO)...Pitched in Arizona Fall League with the Scottsdale Scorpions striking out 34 batters in 20.1 IP in sevengames (two starts). Went 4-4 with a 2.81 ERA (64 IP - 20 ER) in 13 games (12 starts) with single-A Lake Elsinore...Was 3-0 with a 1.56ERA at home opposed to a 1-4 mark with a 4.94 ERA on the road...Limited opponents to .189 clip, including a .161 mark vs.left-handers...Allowed just two HRs (both in one game) in 64 IP (1/32 IP)...Struck out six batters or more in nine of his 13outings, including a season-best 10 K's in six innings, Aug. 8 vs. Modesto...Most productive month came in August, going3-2 with 1.40 ERA in six starts. Made professional debut with Rookie Level Butte of the Pioneer League at age of 17...First three outings as aprofessional came in relief before moving into the starting role...Earned first win as professional, Aug. 21 at Great Falls(7 IP, 4 H, 1 ER, 2 BB, 6 SO)...Set career-best with 12 strikeouts allowing one hit in 7.2 IP, July 25 at Medicine Hat...LedPioneer League striking out 11.7 batters per 9 IP and holding opponents to a .182 average against...Transferred to single-ABoise of Northwest League in late August and made one start (W, 5 IP, 3 H, 3 ER, 1 BB, 6 SO). 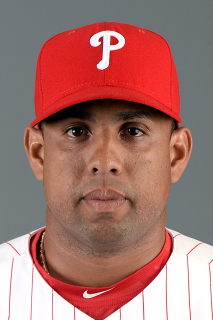 March 24, 2018 Philadelphia Phillies released RHP Francisco Rodriguez. January 28, 2018 Philadelphia Phillies signed free agent RHP Francisco Rodriguez to a minor league contract and invited him to spring training. January 28, 2018 RHP Francisco Rodriguez assigned to Lehigh Valley IronPigs. July 16, 2017 Hagerstown Suns released RHP Francisco Rodriguez. July 10, 2017 RHP Francisco Rodriguez assigned to Potomac Nationals from Harrisburg Senators. July 5, 2017 Washington Nationals signed free agent RHP Francisco Rodriguez to a minor league contract. July 5, 2017 RHP Francisco Rodriguez assigned to Harrisburg Senators. June 23, 2017 Detroit Tigers released RHP Francisco Rodriguez. April 27, 2016 Detroit Tigers activated RHP Francisco Rodriguez. April 24, 2016 RHP Francisco Rodriguez roster status changed by Detroit Tigers. December 26, 2015 RHP Francisco Rodriguez assigned to Tiburones de La Guaira. November 18, 2015 Milwaukee Brewers Traded RHP Francisco Rodriguez to Detroit Tigers and Lakeland Flying Tigers Traded 2B Javier Betancourt to Brevard County Manatees. March 14, 2015 Milwaukee Brewers signed free agent RHP Francisco Rodriguez. October 30, 2014 RHP Francisco Rodriguez elected free agency. February 7, 2014 Milwaukee Brewers signed free agent RHP Francisco Rodriguez. January 7, 2014 RHP Francisco Rodriguez assigned to Tiburones de La Guaira. July 24, 2013 Baltimore Orioles activated RHP Francisco Rodriguez. July 23, 2013 Milwaukee Brewers traded RHP Francisco Rodriguez to Baltimore Orioles for 3B Nick Delmonico. July 23, 2013 Francisco Rodriguez roster status changed by Baltimore Orioles. May 16, 2013 Milwaukee Brewers selected the contract of Francisco Rodriguez from Nashville Sounds. May 12, 2013 Francisco Rodriguez assigned to Nashville Sounds from Brevard County Manatees. May 7, 2013 Francisco Rodriguez assigned to Brevard County Manatees. April 17, 2013 Milwaukee Brewers signed free agent RHP Francisco Rodriguez to a minor league contract. December 13, 2012 RHP Francisco Rodriguez assigned to Tiburones de La Guaira. November 3, 2012 RHP Francisco Rodriguez elected free agency. December 17, 2011 RHP Francisco Rodriguez assigned to Tiburones de La Guaira. December 7, 2011 Milwaukee Brewers signed RHP Francisco Rodriguez. October 30, 2011 RHP Francisco Rodriguez elected free agency. July 13, 2011 New York Mets traded RHP Francisco Rodriguez to Milwaukee Brewers. March 30, 2011 New York Mets activated RHP Francisco Rodriguez from the temporarily inactive list. November 1, 2010 Francisco Rodriguez roster status changed by New York Mets. November 1, 2010 New York Mets placed RHP Francisco Rodriguez on the temporarily inactive list. October 8, 2010 RHP Francisco Rodriguez assigned to Tiburones de La Guaira. August 17, 2010 New York Mets placed RHP Francisco Rodriguez on the restricted list. August 14, 2010 New York Mets activated RHP Francisco Rodriguez from the restricted list. August 12, 2010 New York Mets placed RHP Francisco Rodriguez on the restricted list. January 20, 2010 RHP Francisco Rodriguez transferred to Navegantes del Magallanes from Tiburones de La Guaira. October 8, 2009 Francisco Rodriguez assigned to Tiburones de La Guaira.